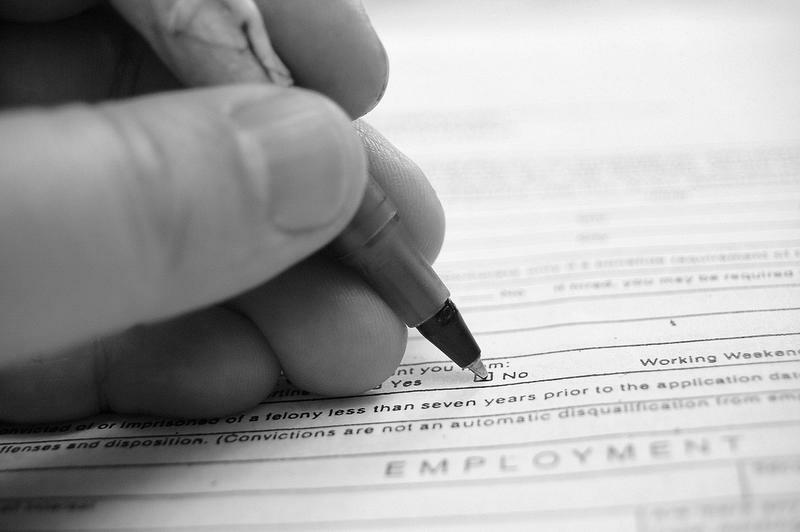 People with felony convictions often face difficulty getting past the first round in the hiring process because they have to check a box declaring their criminal background upfront. But while employers can erase the box, they can still run a background check. Jacqueline Conn has experienced the frustration that box can bring for someone trying to find work after a stay in prison. “I have an undergraduate degree since that time from UT, and a Masters in Science from Carnegie Melon. I have excellent recommendations,” she says. She also has a felony conviction from when she was 19 years old. Conn says now, at age 33, she has trouble finding a job because – she believes – of her criminal record. Conn and other advocates stood outside City Hall Monday asking City Council members to speed along new requirements for hiring practices for all Austin businesses – including private ones. This would be different from banning the box in that it would require employers to wait until a final round of the hiring process to run background checks on potential employees. Advocates say this is how you make sure employers don’t discriminate against people with criminal backgrounds. Some business owners have cautioned the city to move slowly on any such hiring ordinance. Council member Greg Casar has put the item on a committee agenda for discussion on Nov. 9. Have you ever applied for a job where they ask you to check a box if you have a criminal record?